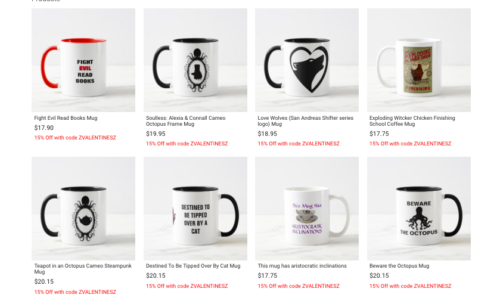 Let us talk about tea, Gentle Reader. That great and fateful, that wonder of all wonders, that calmest and most civilized of drinks. I have been pleased to note, of late, it is making a comeback at steampunk events in particular. At Nova Albion the ConSuite consisted of nothing but tea and biscuits – as it should. In Seattle the steampunk convention greenroom boasted some of the best loose leaf I have ever had. Private stock, of course, but there it is. Let us not discuss the travesty that is iced tea, the mockery that is Long Island iced tea, or that Thing that they do will all the sugar in the South (you can’t see it, but I shudder at the very idea). Let us not delve in to the wondrous exoticism of those foreign notions, primordial and progenitive as they may be: white, green, oolong. Lets us not even think about decaf, for low it really does taste every-so-slightly of fish. 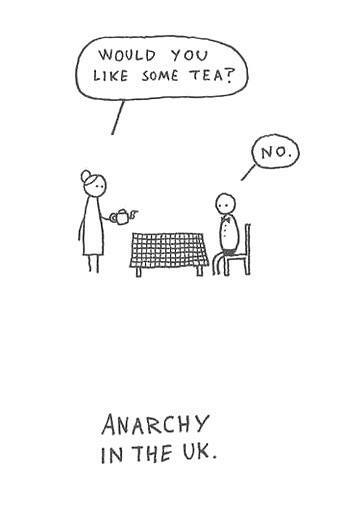 Oh no, let us discuss the truth in tea, the tea of my people, the dark, the honest, the black. My mother is a British ex-pat, who brought with her very little, stayed for 50 odd years, and retains even less. However, she still has her accent and she still has her tea – every day at 4 pm, sometimes 5 – rain or shine. She has done this my whole life. When I was little, I was permitted milk and a dash. Now I take it stronger than she, and I have to reminder her, every time, to let it sit a bit longer for her strangely evolved daughter. I dabbled briefly in coffee during my rebellious college years and I have, upon occasion, tested my own will power by giving tea up entirely, but I always returned to it. My safe haven. It is the taste and the peace and the joy that draws me ever back, but it is also the ritual. 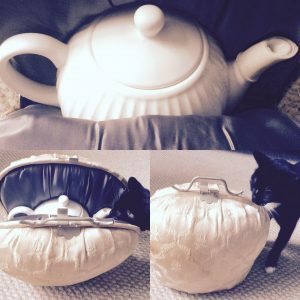 This is a teapot carriage cozy carrier, read about it in this post. I brought a gentleman caller home to my mother’s several years ago. A fine upstanding young man, large and Greek in appearance but very American in sensibilities. In an effort to impress, after the tea was finished, he began to wash the dishes. My mother and I, chatting away, almost missed it. I saw him out of the corner of my eye. Mum must have guessed, from the horror on my face, what he was about to do. He was going to wash the teapot! It was like one of those slow motion cartoon moments. Mum and I, arms pin wheeling out, agonized drawn out cries of “Noooooooo!” as we dove towards him. He didn’t drop the pot in surprise at our behavior, but it was a very near thing. Fortunately, the soap covered scrubbing brush never touched the vaunted and scared interior of that well cured teapot. Thank goodness, for it was the work of decades. A teapot should never be washed. You may swish it out with boiling water. But it should never ever be washed. This is a teapot, by the way, that is only used for black tea. You want to drink that appalling herbal tisane stuff, use a different pot. So how, many have asked, do I brew a perfect cuppa? My training is specific to my mother, as hers was to her grandmother, and so forth back as far as any of us can remember. It is not the training of every tea drinker. And there have been, dare I say it, studies showing that not all the steps are necessary for taste, but who would trust scientists on such a religious matter as tea. 1. 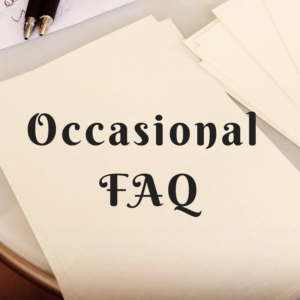 Select a pot, a good china one, with a spout that does not drip, and a lid that stays on. Most pots these days produce four mugs worth of tea, but one should measure to see how many it take. 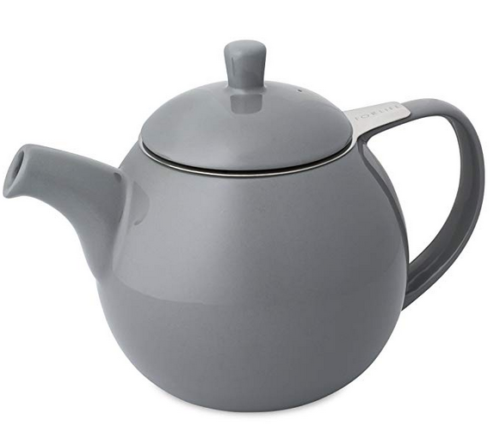 Gail’s current favorite teapot comes in multiple colors and sizes. DOES NOT DRIP! 2. Boil enough water for the pot and then some. Boil it. Boil! 3. Swish a dollop of the boiled water around inside the pot to heat it. 4. Choose a good quality loose leaf black tea. 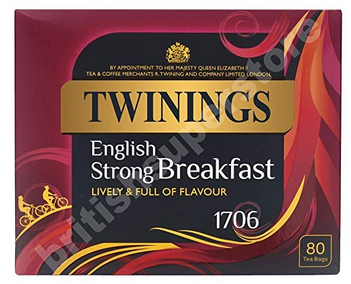 I prefer Twinings English Breakfast Gold Label from England (not the red box American). The quality of a tea can be determined by the smell (not too spicy) and the taste (not too bitter) and the color (for EB a rich dark chocolate brown with hints of rust when seeped) and the size and shape of the leaf (generally larger is better). Gail’s favorite and daily tea. 5. Place a heaped tablespoon into the pot, one for each mug. If the pot is a 6-er or larger, also include “one for the pot.” One will soon learn the quirks of each tea and each teapot and what relationship works best. 6. Add the recently boiled water. Fill the pot all the way, but not so far it will spill when poured. Stick a spoon in and give it a good couple stirs. Cap and cover with a tea cozy. 7. Those who are too immersed in the culture of green teas will allow only a three minute seeping. Those fancy tea timers are equally precipitous. I have even had proprietors of tea shops, who should know better, try to poor for me ahead of schedule. Oh, no no. There will be NO WEAK TEA for this girl. I prefer a five minute seep at least, but I take my tea strong. 8. Now, we move on to teacups instead of mugs. Tea always tastes better out of a teacup, I feel, and a smaller portion allows one to drink it entirely before it gets cold. Choose your cups and saucers with care, you want a nice delicate rim, in makes sipping much more enjoyable and prevent dribbles. But I will admit, these days, I often use a mug because it is easier to carry about the house with me. 9. Put the milk in first. * Good quality whole milk, organic if possible, un-pasteurized if risk is appealing. Lemon is only for the truly quirky. Then poor the tea in after through a strainer. No sugar please. A tea that requires sugar is not a very good tea. A person who requires sugar is not a true tea drinker, they should be excused onto something more banal. Raspberry cordial, perhaps? 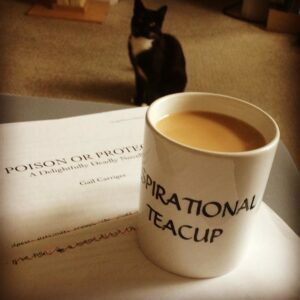 Gail’s shopping list of preferred tea items. The hostess always pours the tea for herself first, unlike most other endeavors. This is because she should test the strength and quality upon her own pallet, and not subject her guest to weak tea, over-brewed tea, or spoiled milk. To drink, one picks up both the cup and saucer, then raises the cup to drink with the free hand. No, the pinky is not stuck out. The cup is returned to the saucer without clinking. Never dunk anything into your tea. All you end up with is crummy tea. And one last moment of comedy. Should you over-brew your tea, my friends and I refer to this as: strong enough for a mouse to run across. * Speaking as an archaeologist I’d like to put an end to the sorry insult to porcelain that suggests this most high tech of ceramics cannot survive boiling water without cracking! Porcelain can take it! It was designed to do so. In fact only very cheap glazes such as those on mugs from Ross, or Medieval purple and green wares can’t take direct boiling water. This has to do with the clay paste to glaze interactions layers. But, I digress. Where was I? Oh yes, there is probably no actual reason behind putting the milk in first versus second, humans are seldom so logical. It’s lower class to put milk in first, upper to put it in second. "Should you over-brew your tea, my friends and I refer to this as: strong enough for a mouse to run across." My late Aged Father's elder sister used to call it "Strong enough to walk a mouse". I've never heard anyone else describe strong tea that way, so it's interesting to find the expression, or one similar, again. That is so nifty! I've never heard anyone else use it either. We adopted the term from a friend's 95 year old great aunt. So perhaps it comes from a specific historical place and time. I disagree with only one thing: dunking, normally in a mug of tea rather than a teacup mind, but I do love a good digestive..
My guide for the milk first/last debate has always been that it goes in first when using a teapot and last when using a teabag/mug. 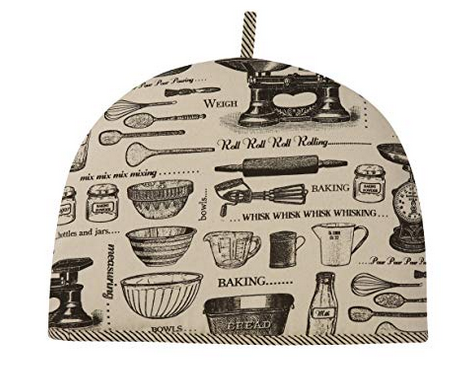 The 'teabag' order is because you don't want the milk getting in the way of your tea steeping. But then I'm a heathen who takes sugar, so don't listen to me. It amazes me how different we all are. I drink two kinds of tea. Tea as you think of it, and that Thing you speak of which down here in Texas is referred to as Sweet Tea or simply Tea. However hot tea is much too hot for most of the year. Hence Iced Sweetened Tea. It's interesting how weather and climate affect culture.